Growing its U.S. workforce by 55% in just 18 months is a precursor for the company's growing ambitions. On Thursday, e-commerce giant Amazon.com (NASDAQ:AMZN) surprisingly announced it plans to add 100,000 new, full-time, full-benefit jobs in the U.S. during the next 18 months. While one big storyline out of this could be how the move puts the company in alignment with President-elect Donald Trump's outspoken priority to create jobs in the U.S., there's another narrative the announcement highlights -- one that investors will appreciate: The big hiring spree reflects the aggressive growth the company believes it still has ahead of it. Adding 100,000 jobs in 18 months would increase Amazon's U.S. workforce a whopping 55% -- from 180,000 to 280,000. It took five years for Amazon to add its last 150,000 employees, so adding 100,000 new employees in just 18 months would mark a notable acceleration to Amazon's U.S.-based hiring. These new jobs will stretch far beyond Silicon Valley. "[T]hey're in our customer service network, fulfillment centers, and other facilities in local communities throughout the country," Amazon CEO Jeff Bezos said in a statement on Thursday. Many of the new jobs will be at new fulfillment centers. An aggressive commitment to job growth follows Amazon's rapid business growth. Steep growth is particularly evident recently, as the company's year-over-year revenue growth rates reaccelerated in 2015 and 2016. After growth decelerated to about 15% year over year in the fourth quarter of 2014, growth rates have since skyrocketed higher. AMZN Revenue (Quarterly YoY Growth) data by YCharts. 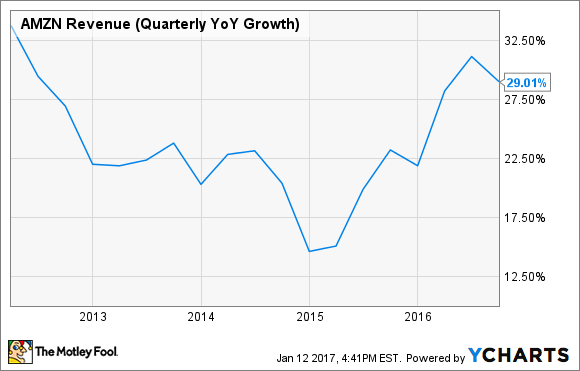 In the trailing 12 months, Amazon's revenue is up 27% year over year. And going forward, it's possible that Amazon's revenue growth could accelerate even more, since its Amazon Web Services (AWS) segment, which is growing faster than its e-commerce business, increasingly represents a larger portion of Amazon's total sales. In the company's most recent quarter, for instance, Amazon's net e-commerce sales were up 27%, but AWS revenue was up 55%. Accounting for about 10% of Amazon's total revenue, AWS is now big enough to add to Amazon's growth -- and its influence over Amazon's total results will likely continue to grow. With growth like this, it's no wonder Amazon is ready to add another 100,000 employees. By committing to such a sharp increase in employees, Amazon is extending a trend of surprising levels of spending demonstrated in its third quarter. The higher-than-expected spending caused the company's earnings per share to come in about 33% below analysts' average forecast. To explain the big spending, Amazon CFO Brian Olsavsky pointed to investments in fulfillment center support, digital content, innovation related to Echo products, AWS support, and an aggressive rollout of Prime benefits, namely, new Amazon Fresh and Prime Now delivery regions. When Amazon reported its higher-than-expected spending in Q3, shares sold off about 5% immediately after the quarterly report was released, and as investors worried about the company's profitability trajectory. But long-term investors know Amazon's big spending is what has kept the company ahead of the competition over the long haul -- and it's likely what will help it continue to win in the future. While committing to another 100,000 U.S.-based jobs in the next 18 months shows Amazon's appetite for heavy investments, it also points to aggressive expectations from management for business growth to continue at rapid rates. Further, big investments into its own business will help Amazon further strengthen its leadership position.